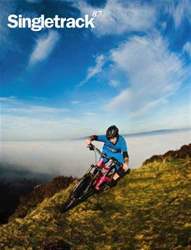 Issue 87 of Singletrack Magazine is jam-packed with so much bikey goodness we’re not sure we can fit it all in between the covers! Our international travel department hits the jetstream, with tall tales of adventure from Switzerland and Ecuador, plus a behind-the-scenes peek at Tracy Moseley’s 2013 EWS campaign through the lens of ace snapper Dan Milner. Closer to home, Alasdair and James Robertson take on a ride through 17 hours of Scottish winter darkness, Greg May has a look at what it takes to go it alone in the bike trade and the Classic Ride heads to Pont Scethin in North Wales. The Grinder team have been beavering away on dropper posts for the grouptest for the past few months, while Steve Worland’s tested three UK-built labours of love from Curtis, Saffron and Shand. All this, plus all the usual column inches devoted to our unique product tests and bike reviews, words of mirth and misery from our band of highly trained performing columnists, and the mouth-wateringly beautiful photography we love to send your way.